The Great Scott Project enters new territory this week -- the classic Adventure International series has come to an end, and we find Scott Adams applying his talents to the brand new QuestProbe series, developed under a licensing arrangement with Marvel Comics. This was planned as a twelve-game series, but industry circumstances in the mid-1980s meant that only three titles were actually released. 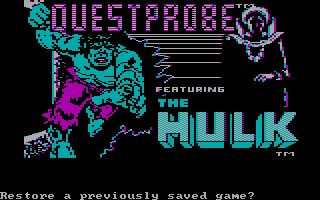 The first, unofficially known as QuestProbe #1, was 1984's QuestProbe Featuring The Hulk. It features the familiar two-word Scott Adams parser engine, with more emphasis on graphics, as closeups and slideshows are used to illustrate key events. Marvel published its own tie-in QuestProbe comic books, with a backstory about an alien civilization under threat seeking to gather the powers of the Marvel superheroes, but the game is standard adventure material -- Bruce Banner and/or The Hulk must round up 17 gems to satisfy the mysterious Chief Examiner. 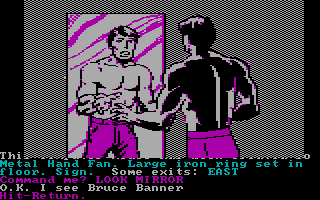 This was the first computer game to feature Stan Lee and Jack Kirby's popular creation, The Incredible Hulk. And to everyone's credit, it isn't just a case of licensing a popular franchise and slapping it onto a generic, pre-existing design. The illustrated versions feature artwork by Marvel legend John Romita Sr. as well as Mark Gruenwald and Kem McNair -- the images are solid and evocative in the Mighty Marvel Manner, despite the limited display technology of the era. The story outline was developed by Scott Adams, working with John Byrne and Bob Budiansky, with Adams handling the implementation. Note the Hit-Return lines -- this sequence is illustrated with a number of drawings, which the player must acknowledge to continue. The quality artwork makes this feel like a true Marvel adventure. The opening credits, copyrights and trademark statements are forced to give away any casting surprises -- we will clearly be encountering ANT-MAN, HULK, the CHIEF EXAMINER, ULTRON, DR. STRANGE, and NIGHTMARE somewhere in this adventure. Questions of continuity and canon are addressed by a sign near the beginning of the game, indicating that this is simply a computer simulation, intended to see if we can master the powers of the Hulk. And neither Banner nor the Hulk ever actually die -- we just get sent to Limbo, where conveniently-placed stairs descend back into the game. We even get to keep all of our inventory items, making this a forgiving game by adventure standards. Did I say this game was easier than some? That was not my initial impression, because I got stuck fairly early in the game. Turning into the Hulk is only part of the battle -- BITE TONGUE only works briefly indoors; within a few turns, and sometimes instantaneously, Some gas fills room & permeates my skin! I'm Bruce Banner now! We can't use the fan to wave the gas away, and it isn't possible to hide from the gas or HOLD BREATH. I found a button that turns some sort of delay on and off, but I wasn't clear on what it really meant. I wasn't able to GO OUTSIDE, JUMP OUTSIDE, or RUN OUTSIDE without succumbing to the High Gravity time and time again. There weren't many inventory items or locations available for experimentation at this point, and I finally had to resort to a walkthrough to learn that I was doing the right things -- I was just not reading the text closely enough, and the artwork didn't help. I had mistakenly concluded that Some gas fills room and permeates my skin! always meant I was transformed back into Bruce Banner, and was not reading closely enough to realize that (with the button pressed) I had an extra turn during which I could get outside and remain Hulked out. The parser is relatively kind to novice players -- GO INSIDE yields Try ENTER DOME, which is actually helpful. And the Hulk's o'erweening Rage is represented as an inventory item -- we can force a transformation back to Bruce Banner if we simply DROP RAGE, though I didn't run into any puzzles that required this. There's not much of a plot structure here -- the gems are really just scattered around the world, often lying in plain sight. Solving a puzzle sometimes yields a treasure directly, but more often provides access to new locations where we can find additional gems. The "fuzzy area" operates as a warp zone with some nice Escher-esque illustrations. It's a bit of a mapping challenge, as it appears there are several Warp locations with identical descriptions but different connections. But there are only a few locations we need to visit, and it's not hard to find everything simply by wandering around. What we really need to notice in the warp zone is the sign -- READ SIGN upholds adventuring tradition, as in: I see leave gems here: SCORE. One potential dead end exists, in the form of a small, dangerous underground room. A natter energy egg stored there explodes within two turns, killing us and worse, destroying the *Bio gem we need to collect in order to finish the game. It's also a physical dead end if we come in the wrong way, though if we wait around, poison nerve gas strikes and sends us to Limbo, from whence we can get back to the main map. The wall in this deadly room has scratch marks on it -- we can't COUNT MARKS, which was my first idea, and we can only SCRATCH MARKS as the Hulk, we're too weak as Bruce. It's best to come in here after we've had a good talk with Dr. Strange. A puzzle I found challenging but fun involves a colony of alien army ants. We need to GET ANTS to help rescue Ant-Man from Ultron, whose pressor beam otherwise keeps us at bay. But even the Incredible Hulk isn't invincible against these rampaging arthropods from another world. They emerge from tiny holes in the ground -- and PLUG HOLES yields only Sorry, too many. The ants can attack the Hulk's eyes, fatally -- and if we CLOSE EYES, they attack his nose. We can PLUG NOSE / USE WAX, but it works much better if we HOLD NOSE and PLUG EARS with the wax instead. Mapping is important here, as having obtained the ants, we still have to travel blind to deliver them to Ant-Man, rescuing him and gaining a *Gem for our trouble. Less germaine to the Marvel license, and more typical of the pure Scott Adams tradition, is a puzzle involving some wax guarded by killer bees. Getting stung by the bees turns Bruce into the Hulk, but gas immediately turns him back, so that doesn't help. Considering the room's wire mesh with bee-shaped holes, we discover that GO MESH returns Sorry, I'm Too big!, which for a while made me think Ant-Man's help was needed here. But what we actually have to do is go outside, and (as the Hulk) WAVE FAN / AT MESH to blow the bees... somewhere? It doesn't quite make sense, but the bees inside the dome are gone now, and we can obtain what I assume is killer beeswax. We need the wax to plug the Hulk's orifices as noted above, and also because, in another of the three domes dotting the Chief Examiner's virtual landscape, we can see an astral projection of Dr. Strange while we're in Hulk mode. He's not nearly as loquacious as in the comics -- instead, he points silently to the baseboard, where we find a Small gas outlet and can PLUG OUTLET / USE WAX. TALK STRANGE sounds like it means something else, but yields this advice from the good Doctor: Remember your worst enemy NIGHTMARE. Taking this literally, REMEMBER NIGHTMARE makes the Hulk very mad, or per the Mirror, very very mad, which buys us an extra turn for staying in Hulk mode indoors. The extra move allows us to PULL RING on the floor in the first dome, and we can carry out more extensive actions as the Hulk, as long as we remember to refresh the Hulk's memory every other turn or so. The REMEMBER verb does not work until we have talked to Dr. Strange, and we must still conserve moves; even the SAVE GAME operation consumes a turn, something I hadn't noticed in Adams' previous games. Further conversation with Dr. Strange establishes that we ought to Look for Scott Adams' next Marvel Adventure at your favorite store! After a third round, Dr. Strange apparently tires of the Hulk's limited conversational skills and vanishes in a puff of arcane magic, leaving a *Gem behind. I like the Bruce/Hulk dichotomy, but game design and license restrictions compromise the Hulk's characterization to some degree. CRUSH [object] yields I don't know how to "CRUSH" something!, which seems highly unlikely. SMASH WALL produces Sorry, The Incredible Hulk (TM) is no vandal! I also did something wrong at one point while maneuvering with eyes closed that I was unable to reproduce -- the parser told me I had lost control of the Hulk, and he rampaged off, creating an out-of-body vibe that was momentarily disorienting. 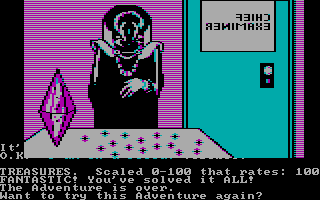 This must be a new maximum treasure count for a Scott Adams game - I found that storing 12 gems yielded 70 points out of 100, indicating there are 17 gems total. 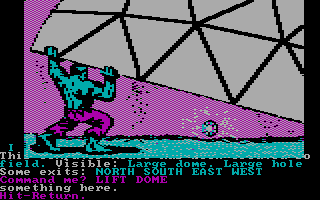 I thought I had solved or at least discovered most of the puzzles, and I had -- but a walkthrough informed me I could LIFT DOME as the Hulk, yielding a gem underneath each. The last puzzle I had to solve involved the Natter egg, which is not a standard part of Marvel mythology but was invented for the QuestProbe games. As the Hulk, we are not killed by the exploding egg, but it still destroys the *Bio gem, whether it's on the ground or in our possession. Examination indicates that something is alive and moving around in the *Bio gem, and that the egg is the size of a chicken egg but glowing, but this information doesn't help us. I tried to COVER EGG - with what? - but had nothing in mind, and no time to WITH anything anyway. SMASH EGG reiterated that the Hulk is no vandal, though one would think this might be an acceptable exception. I resorted once again to the walkthrough, and learned that the Hulk can simply be directed to EAT EGG, with no ill consequences. (This, it would seem, is further counter-evidence regarding my earlier taco hypothesis.) We must be careful when carrying the *Bio gem around, as the alien ants can eat it right out of our hands, so it's best to move this item last and wrap up the game with it. Having rounded up and delivered all 17 gems, we find the Chief Examiner pleased. He gives us a password, ARIA, which I presume is related to some larger series-level goal as yet undiscovered, and confirms our winning score. Victory is ours! I enjoyed QuestProbe #1 Featuring The Hulk -- it's good clean fun in the classic Scott Adams tradition, and while I needed a few hints I was able to figure out a satisfying majority of the puzzles on my own. I wish the design did more to balance Bruce Banner's brains against the Hulk's brawn -- I think some interesting puzzle and storytelling opportunities were missed. As it is, only Hulk mode seems required or desirable -- there's nothing that Banner perceives more clearly, for example, or any place he can go that the Hulk cannot. There's no exploration of the Jekyll/Hyde conflict that makes the Hulk an interesting character, and no character interaction or internal conflict of any substance -- we spend most of the game trying to achieve and maintain Hulk status, in service of a standard treasure hunt. 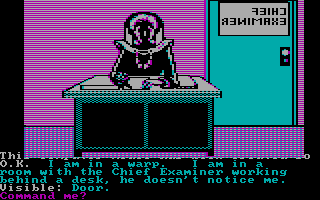 But as the first game in a then-new series based on an established property, QuestProbe #1 met my expectations. It takes its comic-book inspiration seriously, if not to the fullest possible degree, and I look forward to tackling QuestProbe #2 Featuring the Amazing Spider-Man. 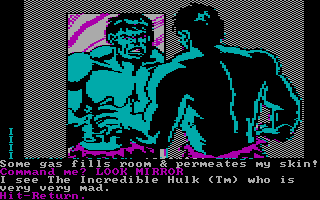 The Hulk was one of many text games where I became hopelessly stuck. Many thanks for the review. Is a Spider-Man review on the horizon? Yep, Spider-Man will be up this coming Tuesday! I just ran across the comic books that tie in to the Scott Adams Questprobe games. I'm pretty excited about it, but I don't know anybody that would understand what I was talking about. So I'm posting about it here! I had a lot of fun writing the story lines for those comics and Marvel then used some great talent to bring them to fruition! There were 3 comics and 12 were planned. Since we never finished the series Marvel wrapped it up another book.